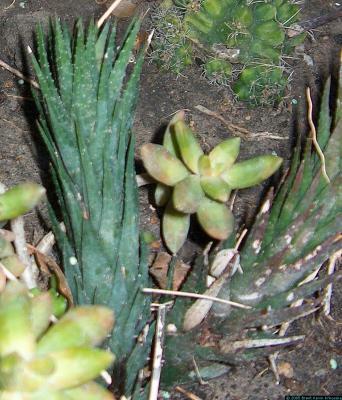 Haworthia glauca has very tough, woody leaves. It has an elongated stem that makes it very nice for hanging baskets. It seems to do best when it's protected from the hot midday and afternoon sun. Like most Haworthia, it likes a loose, well-drained soil and doesn't need very much food. It doesn't have the characteristic root die-back in the fall and can be happy for many years in the same small, neglected pot. Haworthia glauca can take on a pretty gun-metal blue or just be a standard deep green; it seems to depend on how much light it gets, less light meaning more blue.